Is there a market for Eric Staal? Carolina Hurricanes captain Eric Staal checked in at No. 8 on TSN’s 2016 Trade Bait list for players potentially on the move on Wednesday. But Staal, 31, and the Hurricanes are in a holding pattern at the moment. Carolina is 10th in the Eastern Conference in point percentage. They have flirted with the playoffs just enough to make it interesting, but not enough to be considered a real postseason threat. With just 12 days until the Feb. 29 deadline, the Hurricanes are in wait-and-see mode. Should general manager Ron Francis move the pending unrestricted free agent for future assets? Or should Francis hang onto Staal for Carolina’s push to make the playoffs for the first time in seven years? Staal holds the hammer in this process with a full no-trade clause. So far, Staal has played his cards close to his vest. His roots in Raleigh are deep, as one of two remaining links to Carolina’s 2006 Stanley Cup team. He has three young boys at home. His younger brother, Jordan, has seven years remaining on his deal in Carolina. Nonetheless, a tough decision looms. The financial aspect of a potential Stall trade cannot be overlooked: the budget-conscious Canes can save more than $2 million in cash over the final 40 days of the season with Staal off the books. That’s akin to revenue from an extra home game. Realistically, the Hurricanes have a 50-50 shot to make the playoffs, according to HockeyViz.com - which predicts points based on an advanced algorithm that includes possession metrics and save percentages. They have an equally strong chance to miss and end up in no man’s land, picking outside the top five spots of the draft. So, Staal can stay in Raleigh. Or, he can help the Hurricanes stockpile for the future while increasing his market value for July 1 with a strong run while playing elsewhere for a contender. He can always re-sign in Carolina in the summer at a significantly reduced rate if the interest is there. The bigger question is: if Staal were to waive his no-trade clause, what would the market look like for him? Staal is far from a cookie-cutter rental. He has just nine goals and 21 assists for 30 points in 57 games this season, his lowest point-per-game production since his rookie year in 2003-04. More importantly, his salary-cap hit is tied for the 10th highest in the NHL this season at $8.25 million, making Staal by far the most expensive rental available. His play has not been commensurate with his pay in nearly three years. According to GeneralFanager.com, only six playoff-bound teams can afford Staal’s full cap hit on Feb. 29: the Stars, Islanders, Panthers, Ducks, Avalanche and Predators. Dallas’ second and third-line centres, Cody Eakin and Mattias Janmark, are significantly younger and already have more goals (11 and 13) than Staal this season. Rickard Rakell and Ryan Kesler are slotted in those same roles in Anaheim. Similarly, the Avalanche are solid up the middle with Matt Duchene, Nathan McKinnon and Carl Soderberg. That leaves Florida, Brooklyn and Nashville. 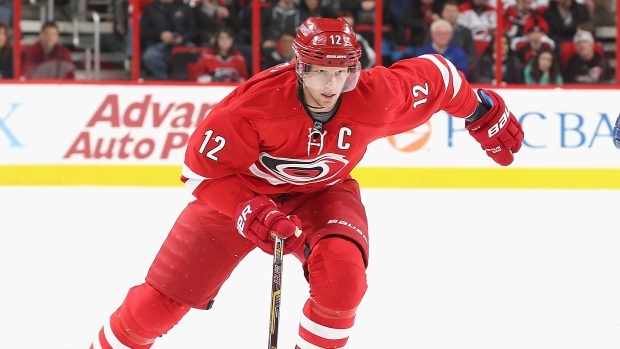 Staal doesn’t outwardly appear a fit with Garth Snow’s speedy lineup. And while the Panthers could use depth at centre, GM Dale Tallon is on the prowl for a big left winger. Forty days ago, before the Predators finagled Ryan Johansen from Columbus, Nashville would have been an ideal destination for Staal. He won a Cup with Peter Laviolette. He would’ve been the big body Nashville needed to compete in the West, bumping Mike Ribeiro and Mike Fisher down the lineup. Alas, Johansen filled that void. The Predators, like the Panthers, are more in the market for a scoring winger. In order for the Hurricanes to maximize value, Carolina would either need to retain a portion of Staal’s contract, take a contract back, or a combination of both. That way, a cap-strapped team might only need to find room for a quarter of Staal’s $8.25 million hit, opening up a new list of potential suitors. It can be done, but it will require finesse. If the Hurricanes and Staal do agree to part ways, the toughest part may be finding a trade partner. Frank Seravalli can be reached at frank.seravalli@bellmedia.ca.